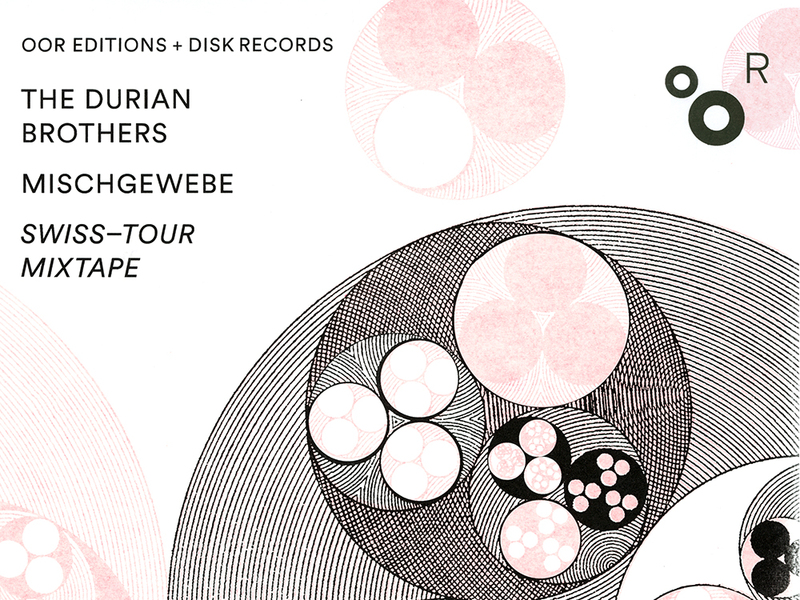 OOR Editions and DISK Records collaborate on the Tape Edition «The Durian Brothers – Mischgewebe» which contains newly combined and mixed live-recordings by the poly-rubber-kraut-tekk-turntablists recorded on their Swiss tour in 2015. OOR and DISK are happy to release the edition at Palace St.Gallen on the 18.03.2017 and on the 25.03.2017 at Café OTO! DISK und OOR SALOON freuen die in Kollaboration entstandene OOR Edition Nr.03, «The Durian Brothers – Mischgewebe» anzukündigen. «Mischgewebe» ist ein mit Plattenspielern gemixtes Tape bestehend aus Live-Aufnahmen der Durian Brothers, die im März 2015 während ihrer Mini-Schweiz-Tour im Helsinki Zürich, dem HeK Basel und dem Palace St.Gallen entstanden sind. Die Edition wird zum einen am 18.03.2017 im Palace St.Gallen und am 25.03.2017 im Café Oto in London getauft.